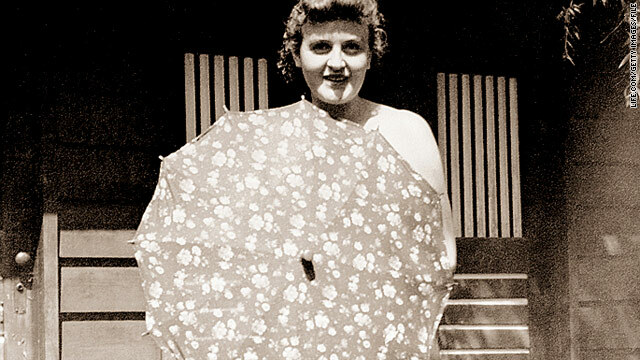 Eva Braun poses behind an umbrella in 1940. Braun was a model as a teenager. Life.com has obtained a set of newly released photos from the personal albums of Eva Braun, Adolf Hitler's longtime girlfriend and, in their final hours, wife. The photos "reveal new dimensions" of the woman who married Hitler as the Russian army closed in on his Berlin bunker and then committed suicide with him a day later. He was 56. She was 33. The 30 photos cover almost all of Braun's life, from images of her as a toddler and schoolgirl to her spending time with Hitler at his mountaintop retreat in the Alps. Among the most interesting images are those of Braun posing seemingly naked behind an umbrella and her made up as American actor Al Jolson in his role in "The Jazz Singer." The photos come from "a cache of images confiscated by the U.S. Army in 1945 and brought to light by collector and curator Reinhard Schulz," Life.com reports.